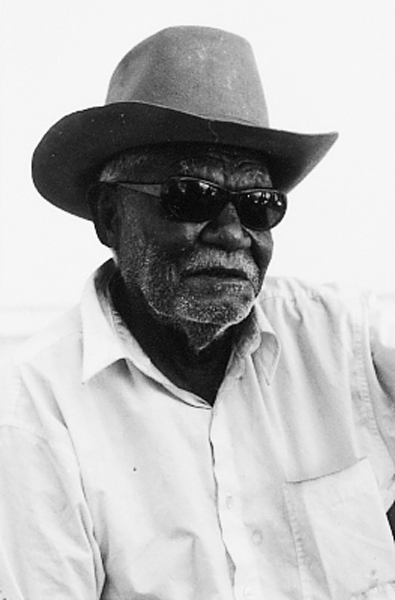 A senior Gija lawman and a highly important figure within contemporary East Kimberley painting, Paddy Bedford was born on Bedford Downs Station south-west of Warmun (Turkey Creek), Western Australia. Bedford spent his youth working in the dry season as a stockman on cattle stations in or near his traditional country, including Greenvale, Bow River and Bedford Downs. Like other Aboriginal stockworkers, in the wet season he lived off the land, learning Gija culture and law and developing a reputation as an accomplished spear and boomerang fighter. In his later years Bedford moved to the main Gija community of Warmun. For most of his life, his painting centered on the adornment of the human body, painting both himself and others for secret ceremonies and public performances. Ironically, Bedford’s talents as a painter were only revealed in 1998, when an art dealer noticed a series of paintings Bedford had made on odd scraps of plywood and other salvaged materials. Originally bound for the town dump, the paintings were saved and Bedford was encouraged to try his hand at painting on canvas. 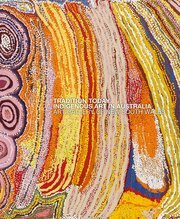 Later that year he joined Jirrawun Aboriginal Arts, which was then forming at the community of Rugan (Crocodile Hole). Bedford became one of the most renowned painters in the East Kimberley, and his work featured in numerous solo and group exhibitions. Bedford’s spare compositions, with their large areas of monochrome ochre separated by subtly dotted lines, often resemble those of Warmun’s most celebrated artist Rover Thomas. But, as is also true of Thomas’s work, the apparent abstraction or minimalism of Bedford’s canvases is superficial, covering a richly layered portrait of country, Ngarrangkarni and history, the significance of which is revealed through the accompanying narrative. 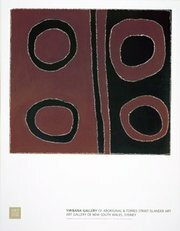 Untitled (Emu) , 1999, illustrates both the seemingly abstract qualities of Bedford’s painting style and the deep knowledge of Ngarrangkarni and country underlying it. At the lower left, the artist reveals the emu ancestor, who plays a prominent role in the series of sacred songs and associated country that the canvas portrays. Simultaneously ‘abstract’ to Western eyes and ‘representational’ to the painter, Bedford’s work, like all East Kimberley painting, defies easy categorisation. It works in a distinctive way, simultaneously concealing and revealing the land, which sets it apart from Western landscape traditions.